Narberth Today Narberth is a tiny Borough measuring about one-half a square mile, approximately one mile from the limits of Philadelphia. Narberth is bordered by Montgomery, North Wynnewood, East Wynnewood, Rockland, and Haverford Avenues. The Pennsylvania Railroad tracks divide the town into a north side and south side. With its small size and user-friendly layout, residents are able to take a short, tree-lined walk to any major service they could need, including transportation, shopping, restaurants, recreational facilities, religious organizations, professional services, the library, and the school. It is a popular choice for local residents because of its dynamic combination of village-like atmosphere and big-city conveniences. History of the Name Narberth is named after a small town in Pembrokeshire, in south west Wales. Early Settlers Edward R. Price founded the Quaker-friendly Town of Elm in 1881, initially intending to bring about some order, after the chaos of the area’s race track period. (see the Merion page for more on this). Development started slowly, but picked up toward the end of the decade with a deluge of smaller Victorian houses on narrow lots. Independence So Why is Narberth independent of Lower Merion? Although introduction of the borough government in 1895 seems to be a dramatic change, it was actually a natural extension of several highly active, civic-minded, residents’ organizations. Other Main Line towns considered independence but only Narberth saw it to fruition because it had a structure already in place that enabled it to do so. Development The period before World War I saw the buildup of the town center, and also construction of the first and biggest wave of hundreds of small and semidetached houses on the north side of town. Development on the south side continued more slowly. 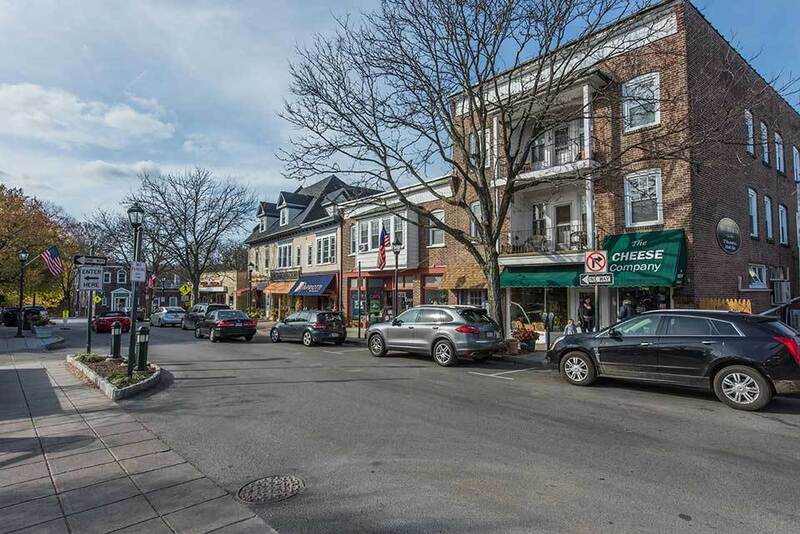 The suburbanization trend following World War II found Narberth with hardly any open land available for new construction The town fathers welcomed developers, who started demolishing big corner Victorian homes and replacing them with apartment blocks and low-rise commercial buildings. Famous Homes Narbrook Park Historic District was entered onto the National Register of Historic Places in 2003. It is a neighborhood covering approximately 14 acres on Narbrook Park (that’s the name of the street) off of Windsor Avenue. Originally called Narberth Garden, this planned, residential neighborhood is considered Pennsylvania’s first conservation subdivision. It contains 25 homes ranging in size from 1,500 to 2,500 square feet. The concept was to have well-designed small houses surrounding a core of preserved open space. This community, served by its own residents’ association from the beginning, has successfully maintained itself over the years by doing its own road repair, tree planting, sharing work projects, and fostering a spirit of cooperation that includes seasonal get-togethers, both indoors and out. Recreation Narberth offers residents some of the best recreational facilities of the Main Line. The Borough has two park facilities equipped with playgrounds for all ages. The primary facility is Narberth Playground, boasting two full-size, lighted basketball courts that accommodate two very active leagues, three all-weather tennis courts, and a large playing field for baseball, softball, football, and soccer.